Sometime between when Wave 8 and 9 of DCUC never really showed up on shelves in my area, and Wave 10 scarcely made its presence known before leaving a sea of Powergirls warming pegs like Cyborgs and Captain Colds before her, I decided that I would be cherry picking DCUC from thereon in, sticking with mostly Batman-related characters and whatever happened to strike my fancy. With the first few previews of Wave 11, one of the characters I knew I must have was The Question. Still sifting through piles of the aforementioned Cyborgs, Captain Colds, and other relics from Wave 7, I jumped on the chance to pick up The Question when I ran into him at a local comic shop. Bio: Vic Sage was the smartest investigative reporter in Hub city, but he could only get so far playing by the rules. So Vic invented an alter ego to prowl Hub’s back alleys – a faceless enigma known to criminals as “The Question.” His war on crime brought him into conflict with Lady Shiva, the world’s deadliest martial artist. Killed in that battle, he was revived and trained by Kung Fu master Richard Dragon. Since his brush with death, the Question returned to action driven by a new philosophy and a burning need to expose corruption and injustice to the cold light of day. Packaging: Nothing new here, The Question comes packaged in the same blister card featuring other figures from the wave on back. 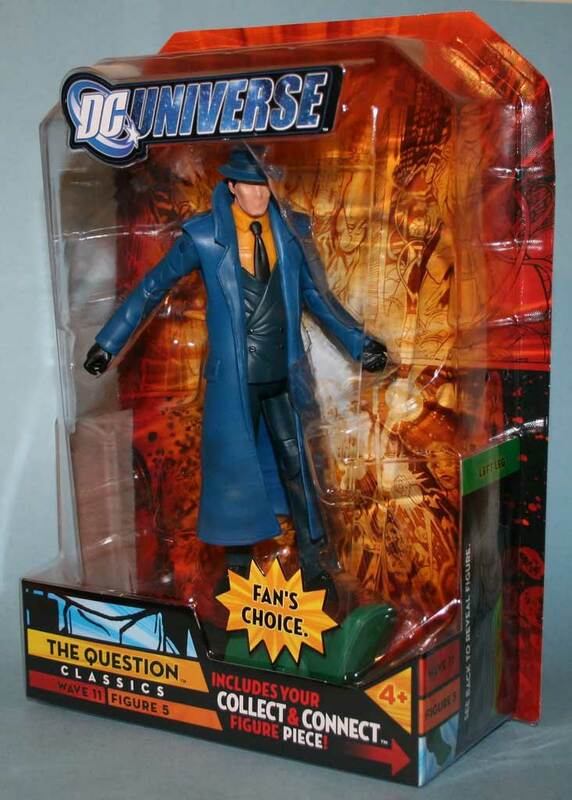 One tiny addition is the “Fan’s Choice” sticker on front, calling attention to the fact that fans voted The Question #1 in the Toy Fare DC Universe Classics Fan Poll. Design & Sculpt: The Question borrows some parts from Gotham City Thug from the Movie Masters line (torso, pelvis, and legs), otherwise The Question seems to offer some totally original sculpting. The trench coat and suit jacket are actually two separate pieces glued together. 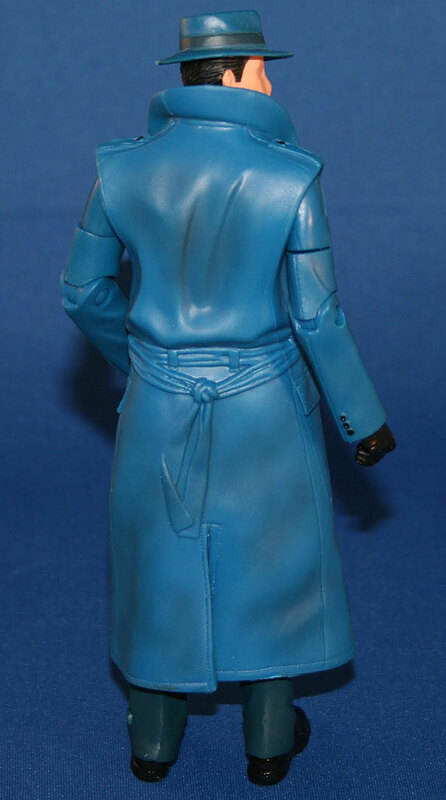 The trench coat has to sell the figure and it does with the details such as the seam lines, collar, lapels, and a belt that is tied behind the back. Most importantly, The Question’s featureless face looks great. The Four Horsemen have achieved the look of a person’s face being covered by a mask and not just a faceless head. Plastic & Paint: While The Question doesn’t have very complex paint applications, he still looks really good. A nice subtle wash on the trench coat gives it a touch of shade. The only detail detracting from the overall look is the yellow plastic used for the shirt, molded in this color it looks a bit toy-ish. Articulation: The Question has all of the articulation we have come to know and love from a DC Universe Classics figure. Oh, yeah, except with that one small exception of the ball joint head. Out of all the figures in this wave, I think the lack of this articulation hurts The Question the most. However, that said, he does seem to be sort of looking down already, so you can still achieve that lurking in the shadows feel. 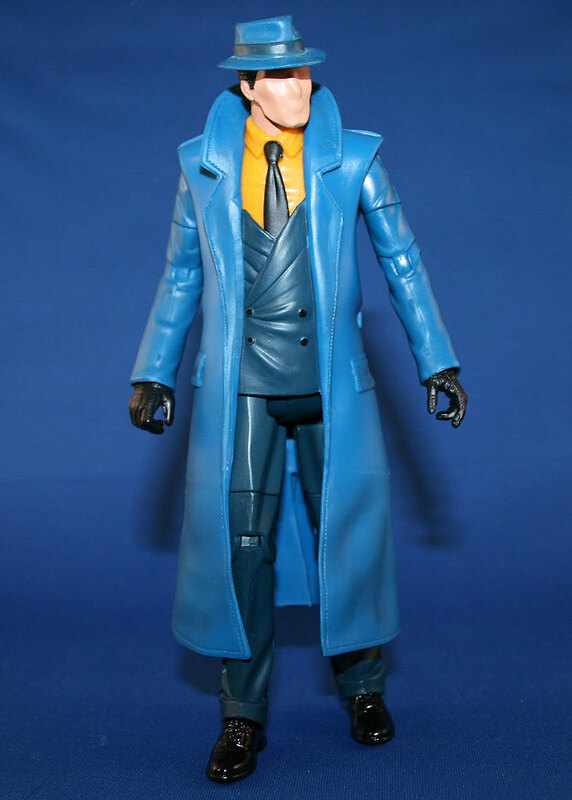 The other articulation that The Question has lost is his torso joint due to his overcoat, but I really don’t miss it that much. Accessories: Wave 11’s Collect & Connect figure is Green Lantern Kilowog, The Question comes Wog’s left leg. Could The Question have been made a better value by having included some accessories? Sure, but what figure can’t you say that about? I’d rather the accessories go towards the two Lanterns, Katma-Tui and John Stewart’s ring constructs. Overall: I am extremely happy with The Question. One might say he looks a little dull, but in a sea of the same bucks, he is a refreshing, and dapper departure from the norm. Along with John Stewart, The Question was one of the must-haves for me from Wave 11. I paid $19.99 for him at Newbury Comics, and although the price may seem high, I certainly don’t regret it. The Question is a great figure, and certainly one of the stand-outs from Wave 11. Nice concise review,he does look like he just popped out of the comic.If he would have a feature,I would like for him to have a removable mask and color changing suit like the old zartan toys. I have this entire wave coming today and I'm most looking forward to Kilowog and The Question. I'll be fixing the head though so he can actually look around. 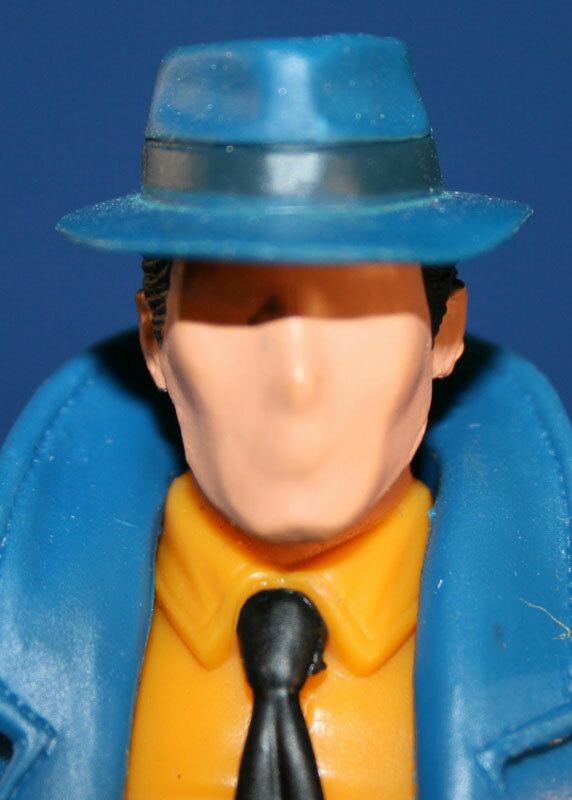 Mechashiva, the old DC Direct Question had a removable mask and hat…that look like a removable mask and hat. It's not bad, but it ain't great. And Prfkt, glad to say I wasn't the only one to get impatient and order him! And glad I did, too. Wave 11 did show up around me @ WM, but if you blinked you'd miss it. I ran into Katma Tui and Shark at one WM (oddly the really bad one of all places) and Cybor Supes at another. When I saw him I hadn't decide to go full Kilowog, so I passed on him… TWICE. Then of course the moment I decided to go full Wog, he was gone! Now Wave 12 seems to be predominantly in my area… mostly Eclipso, Mid-Nite and Spectre. Oddly enough, Newbury Comics seemed to get both waves at the same exact time. What sorts of accessories could you give the Question anyway? I've never seen him outside the JLU cartoon, so I'm somewhat at a loss as to what one could give him and have it be true to the character. I loved this wave… Great figure! Nice review! I'd like it if his jacket and vest were two pieces but i'm not going to cry about it. Now we really do need a Huntress! I'm pretty sure most of this figure is reused parts (for instance, it has the same weirdly proportioned arms as the Joker). Still, I quite like it. 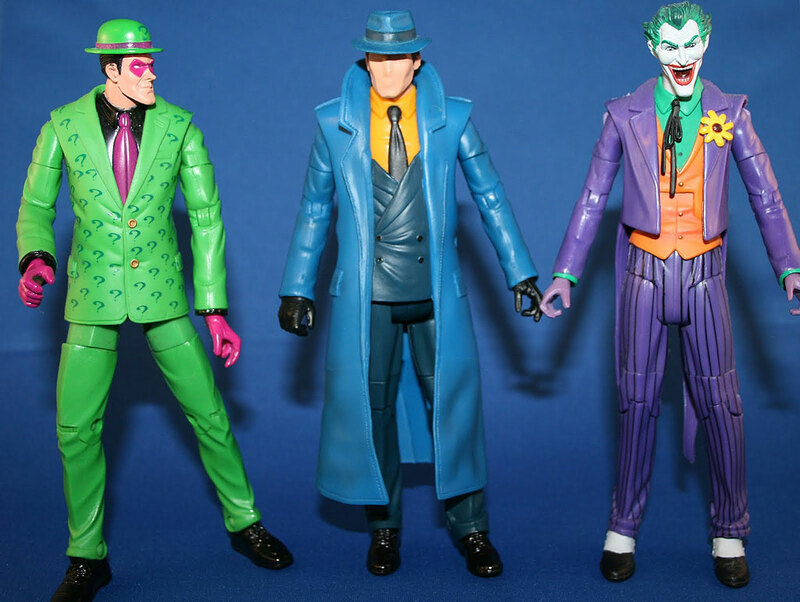 Probably if I already had the Joker or Gotham City Thug I'd be less satisfied, but I don't own either, so it's brand new to me. Wish I could say that about most other DCUC figures. Newbury is the only place I've seen anything DCUC related recently, but I can't pull the trigger at $20.